← Big “L?” Or little? Are international concerns about Japanese atomic problems skewed? Could our media-fueled worries lead us to poor energy policy decisions? Oil and coal, some of the leading global energy sources, appear far more deadly. If these observations are correct, then we need to reassess our thinking about nuclear power. Perhaps we’ve become so accustomed to coal- and oil-driven deaths that they are no longer spectacular. In contrast, nuclear terror is more bizarre, more weird, a better media play. This entry was posted in energy, Geopolitics. Bookmark the permalink. 3 Responses to Fear oil, not nuclear? The difference with the nuclear threat is that, far more than for coal or oil, it is (for all intents) an eternal one. Chernobyl and its surrounding area, for example, is uninhabitable and interdicted now and for the foreseeable future. Remediating environmental damage from mining/extracting/burning fossil fuels, no matter how difficult it is, is at least a soluble problem given current technology. Nuclear contamination on a similar scale is in an entirely different universe of problems, for which we have no solutions regardless of cost. Jeff, isn’t “eternal” limited by half-life? 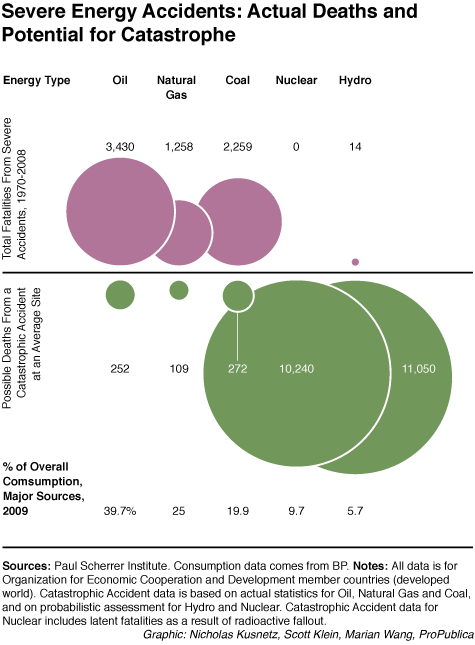 The ripple effects of fossil fuels – coal, natural gas, oil – also extend. We know them, but don’t discuss them. Well yes, I meant “eternal” on a human scale. Half-life comes into play, but I think the half-life of some of the more pernicious by-products is in the 25,000 year range. And it’s true that we don’t much discuss the ripple effects of fossil fuels, but at least we know what most of them are and are able (if not willing) to remediate them.